The symptoms of brake caliper sticking is: Your vehicle will often pull more toward one side when you apply the brakes. You also may notice the brake pedal not coming back up all the way after you take your foot off from it. If you’ve experienced any of these symptoms, then you definitely have brake caliper sticking problems. It is not too common to have sticking brake calipers, but when they are sticking, there are certain causes that could be responsible for it. And if you facing this problem, you should fix it immediately. Below are some common causes of brake caliper sticking. The common causes for brake caliper sticking are with the caliper piston and the brake hose. The piston has a rubber boot on it as well which lubricates and protects it. But if this rubber is torn, it will cause debris and rust to form inside the caliper which means the piston’s sliding abilities will diminish. The rubber boot of the caliper piston is usually torn from careless mechanics who are installing new brake pads. As for the brake hose, it will just wear out over a period of time. Once the hose beings to break, it will cause brake fluid to flow onto the pistons and slow down the vehicle. The worst part is the fluid won’t be able to make it back to the master cylinder either, which will make the caliper stick. And another common cause is with the caliper slides. You see, each caliper has grooves where the brake pads slide into when you step on the brake pedal. When you take your foot off the brake pedal, the brake pads slide out of the grooves. But if there is debris or corrosion built up in the grooves or on the brake pads, the pads will end up getting stuck in those grooves. 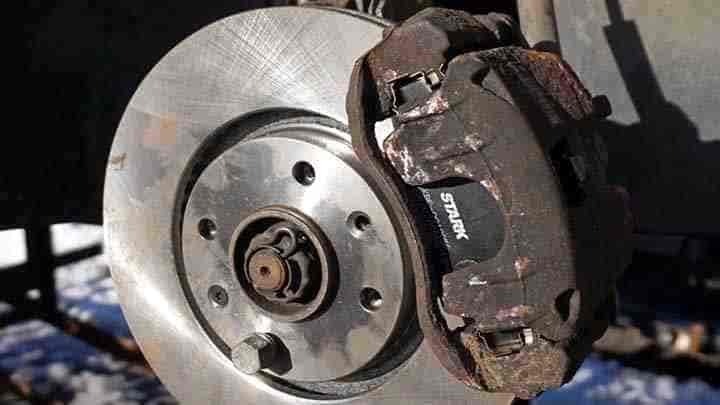 This means the brake pads won’t slide out of the grooves after you take your foot off the brake pedal, resulting in the brake calipers feeling sticky when you apply the brake. And another possible cause for brake caliper sticking is with the caliper’s bolts. These bolts are made to slide as well and they can easily become sticky if they are too dry and not lubed up periodically. The bolts are made with a protective rubber layer to trap the lubricant inside the bolt but this rubber can easily tear and cause the lubricant to spill out. This most often happens by accident when mechanics are installing new brake pads into a vehicle. Once the bolt dries out, it will cause rust and debris to build up which will further deteriorate the sliding mechanism it has. If you facing problem of your vehicle cannot move due to the brake totally stuck, you can read my personal experience below, maybe there are the same problem with my case. Then finally i remove the brake booster and measure the length of PUSH ROD, i found the push rod over standard or over length, so that the rod always push the master cylinder piston and give brake fluid pressure to the each caliper pistons on the brake discs or brake drum, this case causing the all caliper stuck up and the vehicle cannot even move. To fix the problem, i adjust the push rod to a standard length and THE PROBLEM SOLVED.